The ETV Centre was set up in the year 1985 for production of video programmes in various technical subjects and to popularize electronics media. It is well equipped with latest equipments. It has one of the best studios in Northern India and is deeply involved in Video Film Production and ICT based training activities. The centre conducts programmes and provides technical support to other departments to conduct technical and induction training programmes through ICT. Keeping in mind the need of hour, it is setting up milestones in education through ICT. The centre is evolving with the changing trends of education system in the global scenario. The centre is actively involved in conducting short term training programmes in the areas of Soft Computing using Open Source Softwares like SciLab, Open Source multimedia animation and graphics tools such as Art of Illusion, GIMP, Blender and many other free softwares like Google SketchUp, Pixlr, etc. In addition to short term courses, the centre is also offering 6 months and 1 year programmes like Certificate Course in Video Film and Animation Production and PG Diploma in Video Film and Animation Production respectively. Industrial Training for B.Tech, M.Tech and Mass Communication students is also provided in the centre. Antenna Research Lab and Biomedical Research Lab are used extensively by M.Tech and PhD students for their research work. The centre had started using social media for training since 2012. Google Hangout which is a medium of web chat has been converted into interactive online classrooms by the continuous efforts of the centre. The centre also develops multimedia tools/products. SAMS (Smart Academic Management System), a Moodle based Learning Management System is a recent development of the ETV Centre. The expertise of the faculty member and staff of the centre is utilized by various organizations to decide various technical aspects of studio and studio equipments. The centre is actively involved in e-content generation to contribute significantly to the country's mission in digitization of education. Become a centre of excellence in knowledge, innovative development, skill and ethical applications of multimedia technology. To develop innovative tools/technology in multimedia. To infuse scientific temper and ethics in the trainees and students and guide them to research in the emerging areas of multimedia technology. To develop committed and competent faculty and staff striving for excellence and research. To apply innovative tools/technology to infuse latest skills and confidence in learners. To develop cooperative, collaborative and collective linkage with lead organizations for development of technical education and society. To provide knowhow on cost effective ICT support for implementation of digitization of education. To offer innovative education and skill-training programmes on multimedia technology. To prepare competent faculty and technical staff to take up networked based research for effective TEL. (b) Post Graduate certificate course in Video Film Production Techniques. In 1998, the department designed a Post Graduate certificate course in Video Film Production Techniques and launched the same in September, 1998. Till date, 3 such courses have been conducted by the department and the last one came to an end on 16.3.2001. The next Post graduate certificate Course in Video Film Production Techniques is being launched by the department from July-December 2001. 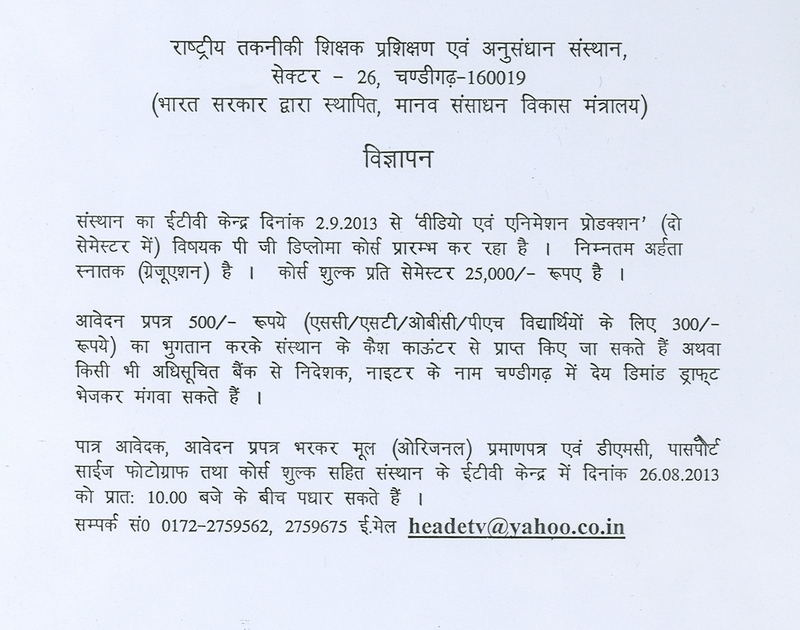 For Indian Nationals course fee is Rs. 35,000/- and the total number of seats are limited to 16. (c) Production of Technical Video Programme for other organisations. This department also develops technical video programmes for other organisation on consultancy basis for broadcasting purposes. 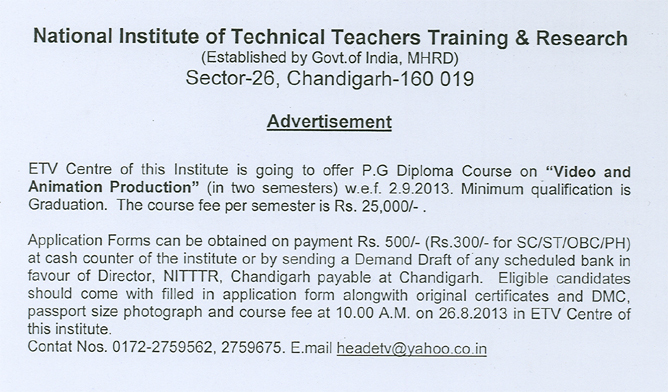 Details of consultancy charges can be asked from principal of this institute. Educational video programmes produced by this institute and by toher organisations are duplicated to vHS format and sold for use in engineering colleges, polytechnics and other institutes of higher learning. These prgorammes are very useful to supplement the class-room instruction in technical institutes. 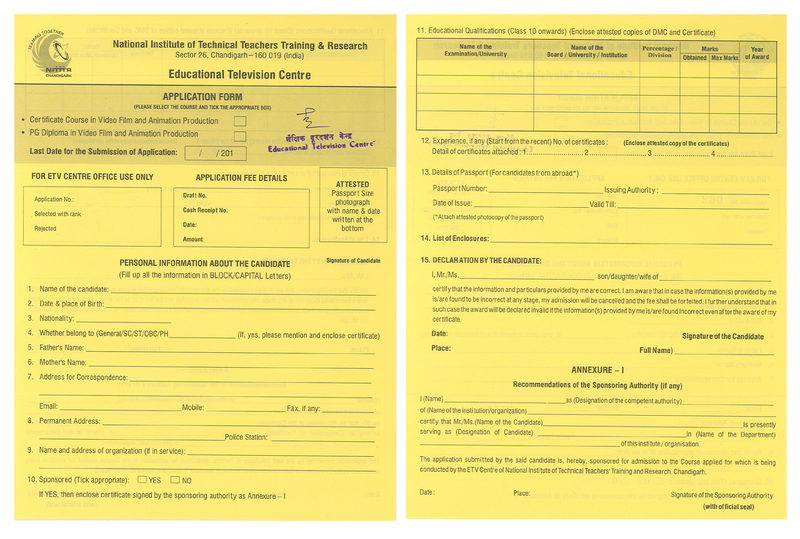 Since 26.01.2001, ETV department of this institute has been selected by ministry of Human Resource Development as nodal centre for broadcasting of technical programmes produced by the four Technical Teachers' Training Institutes in India from Gyan Darshan channel, Educational technical Programmes produced by this institute are being broadcasted from Gyan Darshan Channel of 2 slots of half an hour each daily at 2.30 pm and 9.30 pm for use by the teachers and students of various technical institutes in the country. The spacious main TV studio 54ft x 40ft x 32ft (16m x 12m x 9m) has arrangement of 132 lights operated through remote control hosting system. the studio is centrally air-conditioned and is 100% acoustically treated. It is a boradcast standard TV studio with sound locking entries and has separate PCR, ACR, LCR, VTR, CPR equipped with 3 CCD type multi-camera system for Betacam formats. There are two separate units in which each unit comprises of 3 CCD professional Camcorders, Lighting portapack, Colour Monitors and other related accessories. Two professional Betacam editing setups are available. One Betacam edit setup has A/B Roll facility with Audiomixer, Vision mixer, Videotizer remote control facility with E-file. Second Betacam edit set up has separate digital effect generator, Gemini-III Audio Mixer, Videotizer. The air-conditioned video library has a collection of 400 betacam, 660 U-Matic and 500 VHS cassettes for programme exchange and video film production. There are full fledged facilities for transferring master programmes from U-matic and Betacam format to VHS format through multi-output terminals. The maintenance of laboratory is equipped with facilities to take care of the routine maintenance and repair of Audio Video equipment. The ETV Deparment is offering one year diploma course in Video and Animation Prodcution fromt he month of September, 2013.